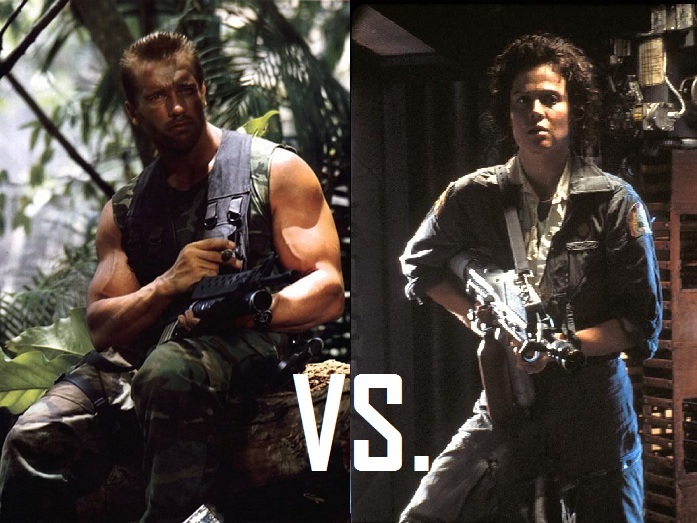 In my honest, correct opinion, Predator is a better film than Alien. While both films share one crucial thing in common, that their narratives both concern a homicidal extra-terrestrial, they are constructed completely differently. 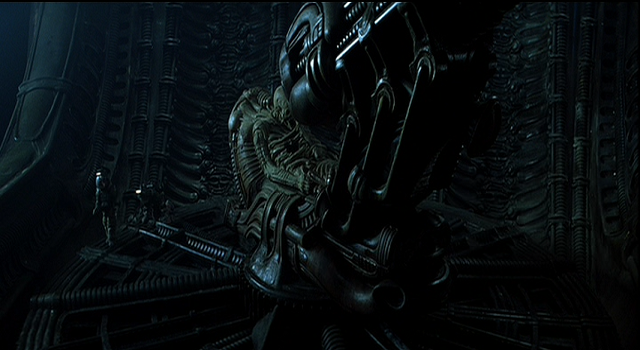 From its score, characters and set design – Alien is all about understatement. On the other hand, Predator is loud, brash and brilliantly macho. Both films have the same central conceit, however Alien, the one that takes itself very seriously, is the one that unfairly claims all the critical praise. Despite the massive amount of praise Alien has been steeped in over the years, it’s little more than a B-movie. The film follows a seven-member crew aboard Nostromo, a commercial spacecraft that is carrying millions of tonnes of mineral ore. The cast of characters are: Ripley (Sigourney Weaver), Captain Dallas (Tom Skerritt), Kane (John Hurt), Lambert (Veronica Cartwright), Ash (Ian Holm), Brett (Harry Dean Stanton) and Parker (Yaphet Cotto). Their routine procedure is complicated when the crew are ordered to investigate an anonymous transmission from a nearby planetoid. During the investigation, they find a nest of eggs, one of which hatches with worrying results. What ensues back on their ship is nothing more than B-movie fare, which usually isn’t a problem, however its aura of restraint and suspense seems to have convinced people that it’s some sort of masterpiece. Despite my reservations, I do think Alien is a good film. Its first quarter is compelling, suspenseful and in one particular scene, very shocking. H.R. Giger’s set design is also striking and original, below is an image of the famous ‘Space Jockey’. Last summer I visited the H.R. Giger museum in Gruyeres, Switzerland; it was very interesting, the Alien imagery could be seen throughout his body of work. Through its use of sound, set design and Jerry Goldsmith’s understated, creepy score, the film creates an effectively eerie aura, but it doesn’t do much more than that. I must note that it’s important to consider the impact Alien had on its release. There’s no doubt that Alien is an epochal film that really worked with audiences, however the elements that made it gripping and original in 1979 have unfortunately been eroded by the dozens of spin-offs. On repeated viewings, the film is restrained to the point of tedium; it hasn’t got the replay value of Predator. Some would say that Predator is one of those spin-offs, but it’s so much more than that. My main problem with the film is its cast, they’re convincing, but the crew members are devoid of charisma, especially Ripley, the leading lady. Predator is by no means an exercise in character development, but its characters are amusing caricatures; the crew aboard Nostromo just leave you indifferent. After the chestburster scene, a truly remarkable moment, the film drastically reduces its use of on-screen gore. The Texas Chain Saw Massacre is testament to the power of sparse amounts of violence, but in Alien, it just feels neutered and disappointing. Also, there are moments that are laughably dated and unfrightening, most notably in the scene captured below. Just Like Alien, Predator is a B-movie, however it’s as a B-movie should be, exciting and pulpy. The film concerns Dutch (Arnold Schwarzenegger), a tough Major who commands a platoon of comparably hard men, including: Dillon (Carl Weathers), Mac (Bill Duke), Billy (Sonny Landham), Blain (Jesse Ventura), ‘Poncho’ (Richard Chaves) and Hawkins (Shane Black). The platoon are traversing through the lush, dangerously vast jungles of Central America to infiltrate a camp of guerilla forces who have kidnapped a politician and his aide. In stark contrast with the believable but boring crew of Alien, the characters in Predator are funny, charismatic and comically masculine, none less than its leading man Schwarzenegger, who delivers his iconic Schwarzerisms with one liners such as ‘Stick around!’ and the now famous ‘GET TO DA CHOPPA!’. Below is a scene I find very unintentionally funny, but female readers be warned, the scene below is pumped with so much testosterone that you may become pregnant. The bloody confrontation at the camp, which serves as the film’s primary action sequence, is brilliantly shot and choreographed, it’s a quality slice of squibby carnage from the superlative action director John McTiernan, who has largely been a wasted talent ever since the superb Die Hard (1988). Unlike Alien, the violence in Predator is strong and grisly, the film hasn’t dated in this respect, and surprisingly its smart use of CGI hasn’t dated either, it remains convincing to this day. 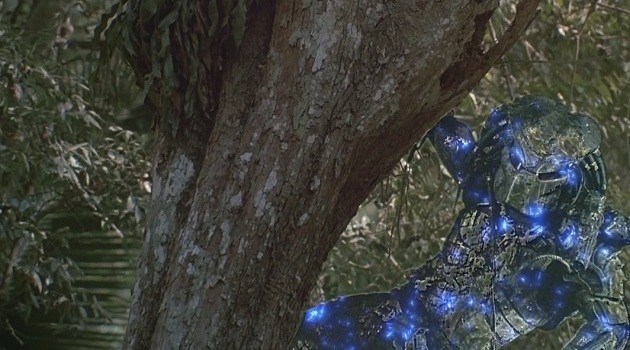 Its smart, resourceful use of special effects means that ‘Predator’ is convincing 26 years later. Predator is a film teeming with life and energy, these vibes being very much compounded by Alan Silvestri’s score, which is both excitingly militaristic and intensely suspenseful. The film takes a B-movie concept and successfully blends the best of the action and science fiction genres, creating a experience which is thrilling, funny and satiatingly violent. Alien on the other hand exercises its talent in typography. I concede that Alien’s typography is superior.